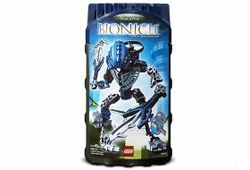 Toa Hordika Nokama is a BIONICLE set released in 2005. She was one of the Toa Hordika. She has two fin barbs and a Rhotuka Spinner and Launcher. In the BIONICLE universe, she was a Toa of Water. She felt more connected to the sea as a Toa Hordika than as a Toa Metru. This is a description taken from LEGO.com. Please do not modify it. (see an archive of the product's page) The fury of water! Includes instructions to build a Rahi sea spider with #8737 and #8741! Her weapons are hard rubber, rather than plastic. Nokama in the remains of Ga-Metru. Facts about "8737 Toa Hordika Nokama"